I don’t know how it is where you live, but the weather in the northeast has been incredibly fickle lately. One day it’s in the 60s and we’re wearing short sleeves and flip flops, and the next we’re bundled up in parkas and three layers of leg warmers because the temperatures plummeted overnight. As a result, I have no idea if spring is really on the horizon or if those intermittent sunshine days are just a tease and we’re really in for six more weeks of winter. One thing is for certain in all of this: the second I see ramps being sold at the farmer’s market, I’ll know that spring is here…TO STAY. These harbingers of spring are one of my favorite indications of spring’s imminent arrival. 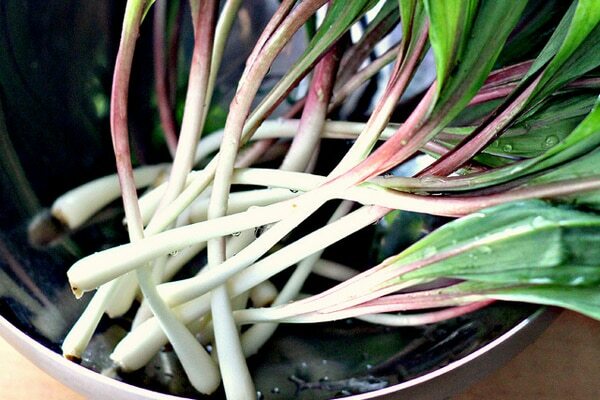 Easily mistaken for a scallion, ramps are a North American species of wild onion. They have broad, smooth light green leaves and deep purple or burgundy stems that give way to a white bulb. Both the stems and the leaves are edible. Ramps are only in season for a few weeks in early spring and are a fan-favorite at farmer’s markets across the US and Canada. Ramps taste like a cross between leeks, onions, and garlic, but are somehow more pungent than all of them! Many people love their strong flavor, but a select few are turned off by it. You can store ramps as you would scallions. Keep them in the fridge with their bulbs in a glass of water so that they stay fresh and hydrated or wrap them in a damp paper towel and store them in the crisper drawer. Either way, they don’t keep very long so make sure to use them within a few days. The best way to eat a ramp is any way that will really let it’s bold flavor shine – so the simpler, the better. I like to use it in place of garlic in chimichurri or pesto and then serve it as a pasta sauce or pizza topping. It can also be pickled, turned into kimchi, or used to season a simple stir fry. The only way you probably wouldn’t want to eat it is raw, straight from the ground, without any other seasonings. The flavor is just too strong for that to be at all pleasant. Thanks for the inspiration. I’ve never used ramps before but now I’m dying to try them!